Todays announcement sees 2,700 sq Km, mostly covering Yorkshire and the Midlands, opened up to Fracking as the Government tries to breath new life into a stalling energy sector. 27 blocks have been awarded to oil and gas companies, a further 132 blocks will be offered later after an environmental assessment. This announcement follows just days after new “Fast track” fracking application process was announced by the Energy Secretary. 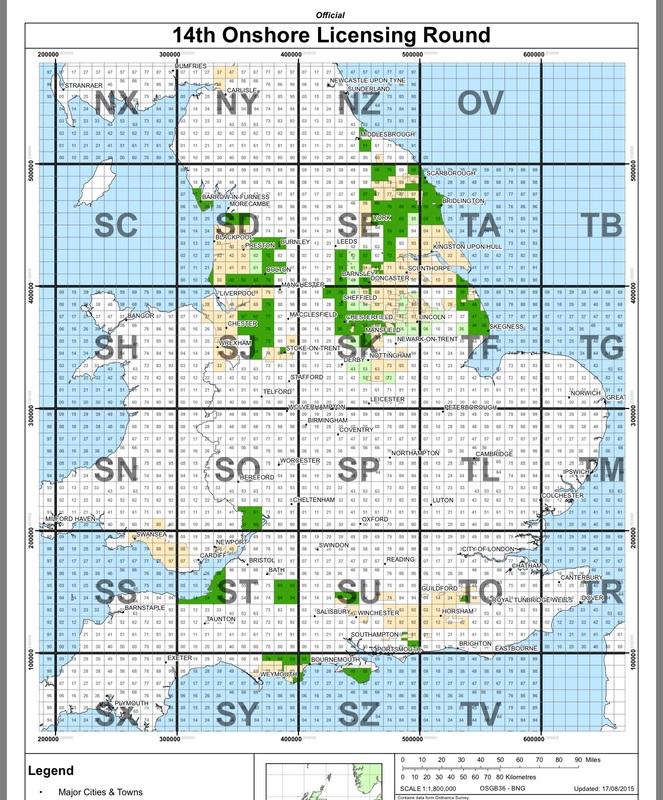 Interactive map of the licence areas. Greenpeace ” Starting a gun to the fight for the future of our countryside…hundreds of battles will spring up to defend our rural landscape”. FOE ” Offering licences to frack will cause more anxiety for people living under the cloud of fracking. The Government is allowing companies to drill right through aquifers that are used to supply drinking water”. Oil and Gas Authority web page. The Guardian reports the licence release. Where were they when wind turbines were being planted in concrete all over the countryside? Drinking water is cleaned up by the water companies already. Few people in Britain rely on their own water supply. Add to that, the G needs the money Badly. The bonanza of North Sea oil and gas is well past peak, and our woefully inadequate politicians know well how natural resources can give the illusion of prosperity which of course, they will be eager to take credit for. There are already (or have been) hundreds of campaign groups which sprang up to defend our rural landscape against useless bird-chopping, bat-mincing wind turbines. And all the groups were run by sensible people, not the useful idiots that Greenpeace, the RSPB and FoE have in mind. I can’t see these campaign groups switching over to opposing something useful and sensible like fracking sites. Greenpeace: gun .. fight .. battles .. defend. Sounds more like a greenwar. Seems that British Gas was privatised by Margie Thatcher. (very clever lady) so it should sink or swim. Efficient companies do not need to worry about competition. The public always benefits if monopolies are broken up by active competition. Take all subsidies away from wind, solar and other so-called “clean” or “renewable energy (such as biomass). Let competition into the supply of electricity and gas and see prices go down, efficiency rise and innovations & new technologies appear. The propaganda war is already underway.